American Made and Owned Manufacturer of Sea Hawk Paints for over 40 years, New Nautical Coatings, Inc. was established in 1978 and is dedicated to bringing only the highest quality products to today’s mariner. 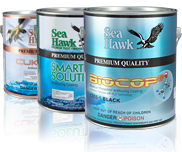 Sea Hawk paints are made with care and attention to every detail. Every gallon is inspected before it leaves our facility to ensure that it meets our stringent quality control requirements. We are a family owned and operated business with a commitment to excellence in our products, service and customer satisfaction. We welcome your comments and encourage you to call us with any questions. We believe that you’ll agree — Sea Hawk products really do work better!